Andy Dufford, lead artist and stone carver for Denver-based Chevo Studios, created the Ford Family Tribute. VAIL — The tremendous contributions that former President Gerald R. Ford, Betty Ford and the entire Ford family made to the quality of life in Vail are now etched in stone, courtesy of Andy Dufford and Chevo Studios, as the Ford Family Tribute now serves as the focal point for The Lobby, the new entry plaza for the Gerald R. Ford Amphitheater. A series of symbolic sculptures and interpretive elements, the Ford Family Tribute features an elliptical bench of buff sandstone circling the main mast of the The Lobby’s new canopy roof, serving as the fulcrum for the space. A hand-carved fountain anchors the stairs, while a timeline of stone and copper marks the milestones of the Ford’s contributions to the Vail community. Dufford and his colleagues at Chevo Studios have created over 40 permanent installations throughout the U.S., including Grand Canyon Amphitheater on the South Rim, Confluence Park in Denver and Agave in Phoenix’s Paseo Highlands Park. He attributes his decision to become a stone carver to his father, along with having the ability to travel and live in Europe. During his time in Spain, he participated in an artist’s residency at La Rectoria in St. Pere Vilamajor, just outside of Barcelona. 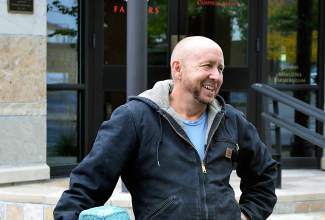 As a teenager, Dufford was apprenticed to a painter, moving on to earn his undergraduate degree in environmental design from the University of Colorado in Boulder. Along the way, he fell in love with rocks. The stone for the Ford Family Tribute is quartzitic sandstone from the Arkins Park quarry west of Loveland. Each time Dufford visits a quarry in search of stone for a project, he looks for pieces that have complexity and character. As you might suspect, it was a rock that brought Andy Dufford and the Gerald R. Ford Amphitheater together. And, it will probably not come as a surprise that Dufford’s new favorite project is the Gerald R. Ford Amphitheater. The newly completed Gerald R. Ford Amphitheater is scheduled to officially reopen for the summer season on Tuesday with the kick off performance of the Hot Summer Nights free concert series. The Gerald R. Ford Amphitheater is a project of the Vail Valley Foundation. For more information on the amphitheater or its summer programming, please visit http://www.vvf.org.